In 2015, cardiovascular disease alone contributed to one in three deaths in the United States. A team-based, patient centered approach to care results in personalized, timely, and empowered patient care as well as facilitates communication and coordination among team members. Pharmacists are well positioned to assist the healthcare team in the treatment and management of chronic disease due to their expert knowledge and training in medication management as well as their high accessibility to the public. To help pharmacists across the country learn how they can improve patient outcomes by developing a collaborative practice agreement, the CDC, along with NASPA and APhA, has just released a FREE Collaborative Practice Agreement webinar: Pharmacist Collaborative Practice Agreements: Who, What, Why, & How. 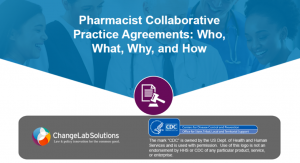 This webinar teaches pharmacists about collaborative practice agreements, provides suggestions about how to establish one, and includes sample language, practical considerations, and more. NASPA is the voice representing state pharmacists associations at the national level. The support, resources, and opportunities NASPA offers to state pharmacists association members and associate members are essential as we work together to advance the profession of pharmacy and improve care for patients.